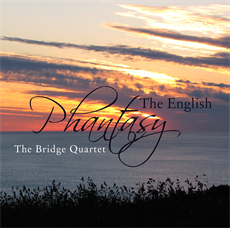 The Bridge Quartet’s new release celebrates the rich variety of the Phantasy String Quartet, one of the forms most characteristic of the English Musical Renaissance of the early 20th century, and a genre re-invigorated by Walter Wilson Cobbett. The disc comprises six ‘Cobbett’ phantasies, based upon the single-movement (but tripartite) 17th-century Elizabethan viol ‘Fantasia’ model perfected by Henry Purcell, including three sparklingly carefree contributions from the very first competition in 1905 by William Hurlstone, Frank Bridge and Joseph Holbrooke. These are virtuoso scores from three confident young composers keen to impress with their knowledge and sometimes mischievously irreverent attitudes to 19th-century ‘Romantic’ idioms. The remaining three, by Gustav Holst, Herbert Howells and Eugene Goossens, date from ten years later, composed during the First World War. Holst’s Phantasy on (Four) English Folk Songs is beautiful and nostalgic; Howells’s prize-winning entry from 1918 is darkly tinted with an austere modality; and Goossens’s contribution, dating from 1915, loosens the bonds of 19th-century tonality and challenges the listener with sonorities more redolent of the 20th century. Most of the works presented here are World Première recordings. Beautifully shaped by Benjamin Frith... Beguiling sounds, graced by the tawny richness and unexaggerated line of Richard Jenkinson’s cello playing... The sense of purpose and sureness of line of Ian Venables’ music is pure oxygen. This is music of great beauty and integrity and the performances fully do it justice. It would be criminal to let it pass you by. The Bridge Quartet approach these pieces with a sympathetic and insightful warmth, and confirm their ambassadorial credentials for British chamber music. A lovely, radiant disc. Duncan Honeybourne’s playing is astonishingly affectionate, yet never saccharine... Honeybourne plays with suave confidence. Rupert Marshall-Luck is an ideal interpreter: generously but not effusively lyrical; agile and athletic... The warm, folk-song like slow movement is at times almost painfully beautiful, with a shimmering pastoral central section... Marshall-Luck is, again, indefatigable and keenly picks up on the work’s melancholic strain. Finely recorded and with comprehensive booklet notes, this is a must for fans of 20th-century English repertoire.